The British Museum is both famous and infamous for its collection of objects that represent key moments in the evolution of human civilization. For those who don’t know of the museum’s infamous reputation, just think about a museum in a country that used to be the world’s most expansionist imperial and colonial power, how do you think those objects were acquired for the museum? Diplomatic gifts? Maybe. But many many objects at the British Museum, particularly their most popular ones, were seized, stolen, or received as spoils of war. Since the British Museum is often mentioned in debates about repatriation of objects within museum collections and other hot-button museum-world discussions, Marabou had to see what the museum was up to in 2018. To be fair, Marabou is going to list the positive and progressive things the British Museum is doing along with the negative and problematic. 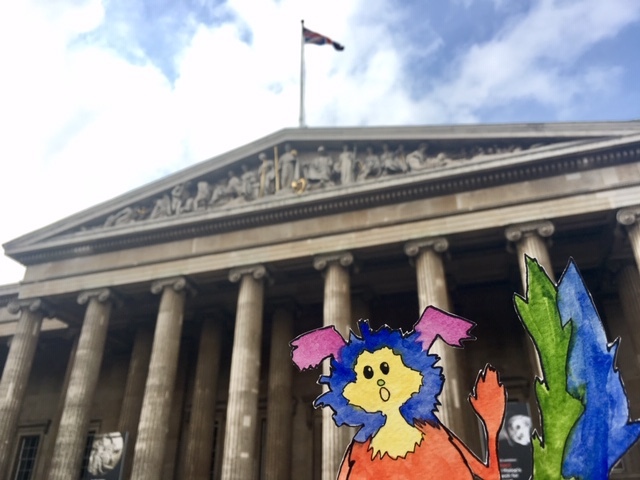 In this post, Marabou is addressing the positive points of the British Museum. An example of the accessibility accommodation of step counts found throughout the British Museum. The first positive Marabou noticed was the British Museum’s efforts to make its space and collections accessibility for visitors. Like many British museums, there is no fee for entry except for special exhibitions meaning anyone can walk in and enjoy the collections. Beyond that, the museum’s accessibility offerings are on par with the progressive United States museums including audio guides in 10 languages, large print guides within most galleries, hearing loops for those with hearing impairment, lifts that accommodate wheelchairs, and wheelchairs to borrow. It really stood out to Marabou that the museum, on both its access webpage and within the museum itself, posts how many steps from one floor to another and from one landing to the next. This may not seem like a big deal, but it’s a thoughtful gesture that removes anxiety for some visitors. We all know our personal physical limits; for some of us the limit is four stairs, for others it’s 60. Either way, listing the number of steps helps manage expectations. If you rather not climb 70 steps, no time is wasted fretting and no need to miss out, the elevator is your option. Marabou thinks museums in the United States should add this accessibility accommodation. The orange stickers are part of the “Desire, love, identity” program at the British Museum. Visitors are encouraged to visit the program’s website for more information. Busts of Hadrian and Antinous. Room 70. Roman concepts of sexuality differed greatly from those of modern western societies. A Roman man was free to choose sexual partners of either gender. The idea that men should be dominant socially and sexually was central. If a man remained the active partner in sexual encounters his masculinity was not questioned. The emperor Hadrian (AD 117–38) was in his late 40s when he met Antinous, a Greek youth from Bithynia (modern Turkey). Antinous became the emperor’s lover. During an imperial tour of Egypt in AD 130, Antinous drowned in the Nile and Hadrian’s outpouring of grief was unlike anything seen before. The emperor publicly commemorated Antinous in statues across the Roman empire, an almost unparalleled public memorial to a lost love. The two busts in this image can both be found in Room 70, but were not made to be displayed together. Marabou appreciates the acknowledgement and sharing of LGBTQ stories that are inherent in historical objects. Now for some critiques. In terms of access, Marabou wonders why visitors must go to a website to read this information instead of just having this content out in the gallery. If you can put an orange sticker directing people to look up info on a website, why not go a bit further and just put the additional information on the pedestal or display case? There are just a handful of objects in the museum that are part of this program. Marabou doesn’t believe time and resources are why this information isn’t presented for all. Perhaps the museum doesn’t think this content is of interest (or appropriate?) to everyone. The language used on the program’s website hints at this. Although the British Museum is sharing a less widely acknowledged perspective on Roman life, the opening line of the Hadrian and Antinous webpage is othering. To say, “Roman concepts of sexuality differed greatly from those of modern western societies.” suggests there is an presently existing “normal” and the Romans did not fit into that. It’s not clear what part of Roman sexuality the British Museum thinks is so different. Is it the fact that men took both male and female sexual lovers? Or is it the age difference between Hadrian and Antinous? What does the museum mean when it is stated, “If a man remained the active partner in sexual encounters his masculinity was not questioned.”? Does the institution mean “dominant” instead of active? It does not sound good for only on person to be active in a sexual encounter. The use of inaccurate language is something Marabou notices across informational texts at the British Museum. Whether it’s the description of LGBTQ stories associated with objects in the institution or British expeditions that involved pillaging and looting (more on that in a later post), the museum is acknowledging these stories and histories, but the way they say it, the words chosen, often display bias. In the case of Hadrian and Antinous, the British Museum addresses their romance, but frames it in reference to heteronormativity. Applying LGBTQ-specific lenses on existing objects in the museum’s collection is great, but let’s share the love. When considering the 17 objects selected, most focus on homosexual relationships between men or the gender fluidity of deities of various cultures. Two focus on lesbian relationships. Perhaps future iterations of this program will include a broader variety of the LGBTQ spectrum. At the end of the program’s website the British Museum invites visitors to contact the institution if they see a possible LGBTQ historical perspective represented in one of their museum objects. This is a nice gesture, but why not make this a more public ask somewhere in the museum instead of burying it at the end of a website that is only listed on stickers used sparingly in the galleries? Of course there is always more work to do. Marabou thinks the “Desire, love, identity” program is off to a solid start and hopes to see it actively grow as a part of the museum’s overall curatorial program instead of remaining an initial gesture during LGBTQ month. Room 18, the Parthenon Sculptures. Marabou is looking toward what remains of the Parthenon’s east facade that displayed a sculpture program representing the birth of Athena. The third positive starts to take us into the more controversial grounds of the British Museum, its collections, and acquisition methods. One of the museum’s most visited galleries contain the sculptures that once decorated the Parthenon. You know the Parthenon, the most famous building from ancient Greece, a classical temple dedicated to the goddess Athena that also served as the city’s treasury, a structure that (for many) embodies the ideals of Ancient Greece and western democracy. The Parthenon’s structure is still in Greece, but why are half of the Parthenon’s still-surviving decorative sculptures in England? Many people are asking this question. In fact, this discussion has been going on for years. The majority of sculptures is equally divided between the Acropolis Museum in Athens and The British Museum in London. Other museums, including the Louvre in Paris and Vatican Museum in Rome have other pieces. In 1980, the Greek government requested the permanent removal of all Parthenon sculptures from the British Museum and that they be returned to Athens. The debate on whether the British Museum should return these sculptures is on going to this day. Marabou reads the sign that offers a leaflet that explains the British Museum’s perspective on the controversy over the ownership of the Parthenon sculptures. By 1800 only about half of the original sculptural decoration remained [at the Parthenon]. Between 1801 and 1805 Lord Elgin, the British ambassador to the Ottoman Empire, acting with the full knowledge and permission of the Ottoman authorities, removed about half of the remaining sculptures from the fallen ruins and from the building itself. Lord Elgin was passionate about Greek art and transported the sculptures to Britain. Their arrival in London was to make a profound impression upon western ideas of art and taste. It promoted the high regard that the European Enlightenment already had for ancient Greek civilisation. Before they went on show at the British Museum in 1817, they were first seen from 1807 in Lord Elgin’s temporary museum. The public display of the sculptures from spring 1807 encouraged Hellenists in their love of ancient Greece while, at the same time, it inspired the Philhellene movement in its sympathy for the inhabitants of modern Greece and their struggle for independence. Since then the sculptures have always been on display to the public in the British Museum, free of charge. The legality of the sculptures’ acquisition and details of Greece’s ask to return the marbles are not addressed in the gallery pamphlet but are found when searching “Parthenon” on the museum’s website. The page is entitled “The Parthenon sculptures: The position of the Trustees of the British Museum.” This page also “myth busts” a lot of what is said about the controversy and makes all efforts to challenge any accusations of unethical shenanigans by the museum. In a paragraph that discusses lending the marbles to Athens for display (long or short term, but nonetheless temporary) it is asserted that, “The British Museum is the most generous lender in the world.” This is the British Museum patting itself on the back, but such a statement begs the questions, “Why are you the biggest lender of stuff? And who are you lending it to? Isn’t it strange to lend objects to a country from which the objects originate?” In the pamphlet it says, “The British Museum tells the story of cultural achievement throughout the world, from the dawn of human history over two million years ago to the present day.” Again, this is another boastful statement, but how do you build such a collection? How were the objects in your collection acquired? Marabou does not feel the “entirely legal” (per the museum website) means of acquisition over 200 years ago solidifies the museum’s case of ownership. Although Lord Elgin received the permission of the Ottoman Empire to take the marbles to London, the Ottoman Empire no longer exists and it’s fair for the country of Greece to want is cultural patrimony in as complete a state as possible. Another argument for reconsideration of ownership is to acknowledge that what was right and legal 200 years ago is not necessarily right in 2018. The following is the British Museum’s position as written in the gallery pamphlet. Where do you stand in the debate? Within the context of this [The British Museum’s] unparalleled collection, the Parthenon sculptures are an important representation of the culture of ancient Athens. Millions of visitors admire the beauty of the sculptures each year–free of charge. They also gain insights into how ancient Greece influenced and was influenced by the other civilisations that it encountered. The Acropolis Museum allows the Parthenon sculptures that are in Athens to be appreciated against the backdrop of ancient Greek and Athenian history. This display does not alter the view of the Trustees of the British Museum that the sculptures are part of everyone’s shared heritage and transcend cultural boundaries. The Trustees remain convinced that the current division allows different and complementary stories to be told about the surviving sculptures, highlighting their significance for world culture and affirming the universal legacy of ancient Greece.